One would gather from the tone of these typical headlines that the machines of this world are engaged in an organized revolt against humanity. It’s not by accident that machines like the ones mentioned above are given a not-so-subtle personification. If we can somehow assign to them an intrinsic willingness to cause harm, can we not then by-pass the real culprits and eliminate the machines? And believe me, there are those among us who think a world suddenly devoid of SUVs, big rigs and oil wells would be heaven on earth. Now comes the story of the cunning and sinister starter’s pistol—the one which fires blanks and has been used for decades to initiate the common footrace at all levels of competition. The Olympic .380 Model BBM has been banned in the United Kingdom because criminal gangs have modified and used that particular model in several shootings. Other movements are underway globally to eliminate the starter’s pistol from high school competitions because of it’s “deadly image”. Yet many of the supposedly impressionable victims seem to have no qualms about playing video games which depict the gut-strewn aftermath of terrorist violence. The revolver has been the ideal starting implement for years because of its reliability and its auditory and visual signal. It would be acceptable to me in principle, to replace it with a device which can duplicate those features, in the name of progress (although sentimentally, I would hate to see the pistol go). But to replace it on the basis of image or potential harm would be misguided and just plain wrong. And no – a horn, or bell, or beeping sound to start a footrace just will not do. When man first picked up a stick or a stone, he discovered the value of the tool – an implement to make his life easier. Unfortunately, the intent behind the tool has not always been a benevolent one. But the evil resides in the tool user—not the tool. If banning the machine is not the answer, what shall we do? Ban people? No. Hitler, Idi Amin and Pol Pot have tried that. In addition to varying levels of good and evil, humans have an inherent measure of common sense. It may be buried beneath layers of programming, propaganda and political correctness but it’s in there. 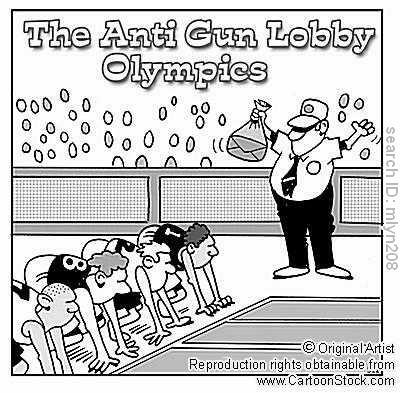 And once found, a little application may lead us to conclude: yes, we can keep our Olympic .380 model BBM (until something better comes along). This entry was posted on January 15, 2011 at 9:45 am and filed under politics. You can follow any responses to this entry through the RSS feed.